See that drop off onto our front patio to the left of the front door, between the green post and the door? That is where we wanted planters – to sort of highlight the entrance to the house AND to keep kiddos from accidentally stepping off our entry walk. 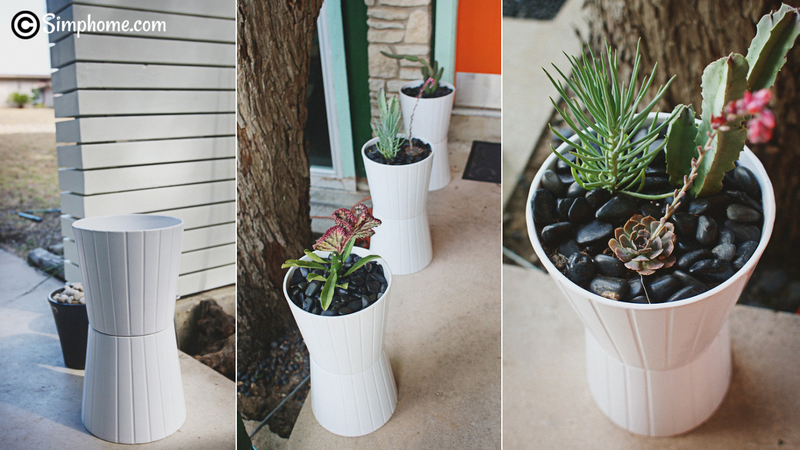 So, while browsing IKEA one day looking for options, we found these – the Kardemumma series of plant pots (say that three times fast!). We loved the simplicity of them, the color (they only come in white which goes perfectly with our new horizontal slat wall) and the mid century looking raised pattern on them. The largest size (9 1/2″ base diameter) was just perfect but they were too short. So, Mike came up with a genius idea to glue them to each other, base to base…to make them taller and to create an awesome mid-century looking shape. Here is one after gluing – we used liquid nails for a solid hold. Worked like a charm. Then, I made a trip to the local succulent nursery – East Austin Succulents to find some pretty succulents to plant – and bonus that they don’t require much water since we are in the midst of a very long drought here in Austin. Oh, and they are generally hard to kill (I knock on wood as I say that)! They had a pretty amazing selection, it was almost overwhelming. But, I picked out my favs (including one that the owner had dubbed his ‘crown jewel’)… Then, we got to work planting! Once we planted them, we used some dark grey river rocks (50% off at Hobby Lobby that week) to cover up the dirt. I’m weird about dirt in planters, I don’t like to see it. I like to cover it up with rocks. I guess I think it looks more modern. So, here is the result, which we finished just in time for Zoey’s party! I think it will look much more amazing once our siding is complete and we have our canary yellow door to set it off.